It’s time to start preparing for the perils of winter driving, and commercial tire chains are an important and often overlooked part of this preparation. A lot of truck drivers might simply throw them in the truck and consider themselves good to go, but there are a number of things to consider; Drivers need to know how to install them, check and maintain them, and be aware of the local laws that regulate their use. 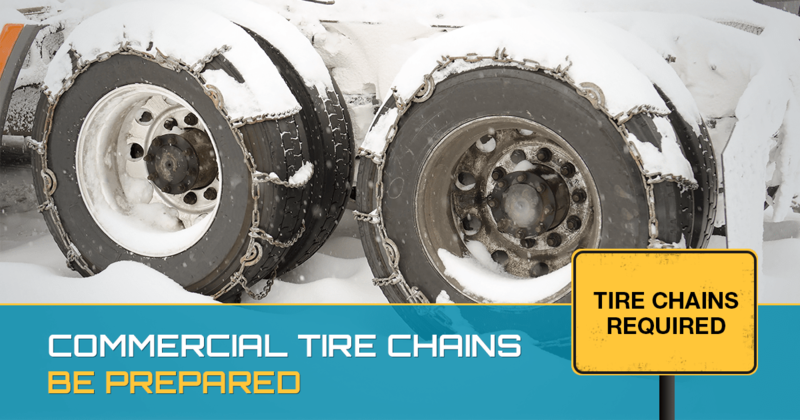 The common theme when dealing with commercial tire chains is simply to be prepared ahead of time. That means knowing how to use them when and if they are needed. You don’t want to be figuring out how to put on tire chains in the middle of a snowstorm or when you are already in a nasty situation. Don’t read the instructions or a basic guide and think you are all set, practice is really the key and when it comes to tire chains learning by doing is absolutely the best method. The type of chains used, various connecting hardware, and even the wheel will impact just how tire chains are installed. One universal tip? Always check the chains after driving a short distance as the chains will seat against the tire and require tightening. Going through the work or putting them on just to lose them down the road is not going to make for a good trip. Taking the time to practice putting on tire chains has one great advantage, it’s the perfect time to inspect and maintain the chains themselves. Chains are bound to be a little rusty, but make sure and verify that the rust is not getting out of control and weakening any vital links. The connections themselves are another important check as these can come loose and get lost fairly easily. Make sure that all of the connections are serviceable and present, sometimes the only way to do this is to try out your chains on a dry run. Some states require truck drivers to carry chains during certain times of the year. It’s always important to check state regulations, but don’t gloss over the section on chains. If they require them, then there’s a good chance you might need them, and you don’t want to get nabbed on an inspection anyway. Your yearly inspection and dry run on the chains should also consider if they are compliant with the regulations on any possible interstate routes. As important as it is to understand how to use and maintain your commercial tire chains and the local laws and regulations, it’s equally important to understand when not to use them. All professional truck drivers should know how to use chains to get out of a jam and how to drive in mild winter conditions. But it’s just as important to understand when you should just stop and wait out a blizzard or winter storm. No cargo is worth losing your life over. Practice using your chains, make smart decisions, and stay safe out there.